The Reishi mushroom is one of the oldest medicinal mushrooms known. Largely used in China, it's name literally means "Supernatural Mushroom". In China, Ganoderma lucidum is called Lingzhi and in Japan it is called Reishi. The Reishi mushroom is a polypore mushroom that is soft, corky and flat. The cap looks like it has been red-varnished and is kidney-shaped and grows to an average of 8 centimeters across, even though many larger specimens have been found. The underside of the cap has white pores that contain fine brown spores. The Reishi mushroom grows at the base of the stumps of deciduous trees, especially the maple tree. For centuries the Chinese have called this medicinal mushroom the "Mushroom of Immortality", Ling-zhi - the "Supernatural Mushroom". No matter where you search for information regarding Reishi, the consensus is always the same - no matter what the ailment, this mushroom should be your first choice in health care. At present, Lingzhi is a "health food supplement" to support cancer patients with their diet, yet the evidence supporting the potential of direct anticancer effects should not be taken lightly. 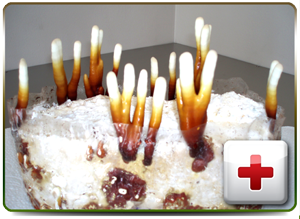 The compounds within Reishi can be classified as an anticancer agent when current and more direct scientific evidence becomes available. There are many ways to grow the Reishi mushroom. 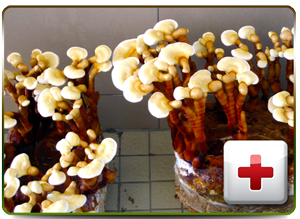 Some cultivators grow Reishi in containers with little air-exchange so that the carbon dioxide levels stay high. This causes the mushroom to grow long and thin. This is called an "Antler". Other cultivators grow Reishi with high oxtgen levels. This allows the Reishi to grow into a fan shape called a "conk" or bracket. Our personal favourite is to grow the Reishi in "Antler" form. The Antlers are then processed and formulated into our new MG-LZ8 product. When Reishi is grown in an Antler form, it creates Ganoderic acid from the base to the very tip, which is substantially more Ganoderic acid than that found in the normal, short stem of a conk.​ Our proprietary growing system was developed around the production of Ganoderic acid and the development of the immunomodulatory gene LZ8.